This is Roscoe, one of the sweetest donkeys I have ever met. A woman owned a farm and decided, quite suddenly I might add, to move to another state. She had her horses, dogs, and home packed up and moved. When the farm manager arrived to clean up and get the place ready to sell, he found Roscoe in the barn. 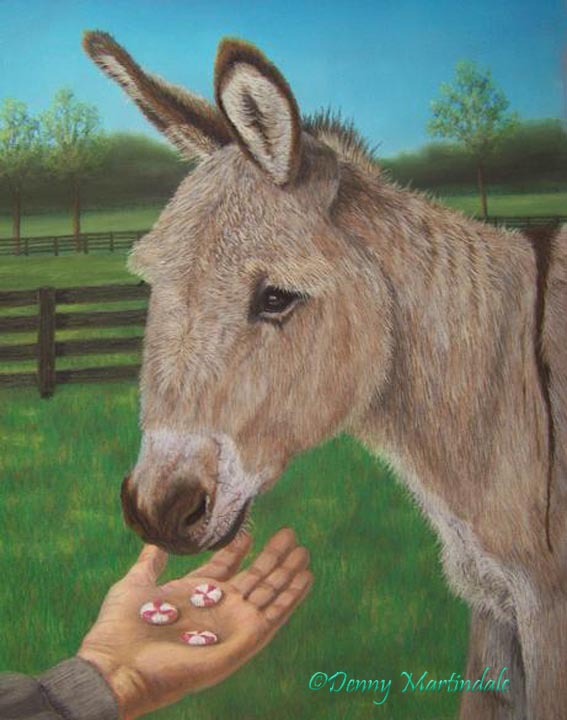 He was unable to contact the woman, so he ended up keeping Roscoe, who loved to eat peppermints everyday and he would follow you around until you gave them to him. When I went to get a few photographs to prepare for his portrait, he was quite aged. I fondly remember him following me like a puppy. He was a special one to meet and paint.